My goal for 2010 was to run 25 miles a week. I came close enough to this goal to feel pretty damn good about my year in running. There were days missed while on vacations, suffering from a lack of sleep or freezing cold weather, but mostly I managed to run 5 days a week. And the days missed? Well, that's just life. I plan to keep my goal the same for 2011. I like running 5 miles a day. I'd like to run longer distances again (and finish another marathon! 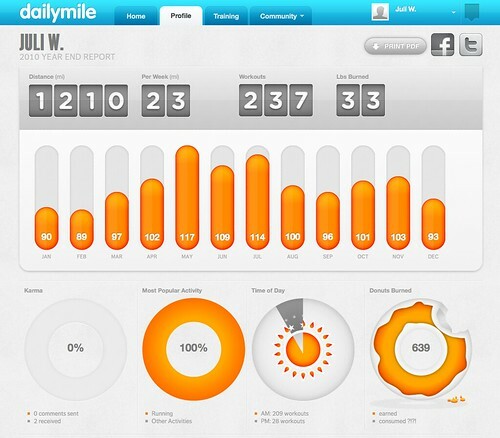 ), but right now I know it would be way too unrealistic to up my goal mileage to 6 miles a day. There isn't always time, for one. I do try to run 6 miles when I can and when it feels right and that's good enough for me. Running is one of my favorite parts of the day. Even when I don't feel like going but go anyway, it ends up being such a good thing. It gets my blood flowing and sometimes my thoughts flowing as well. I get a lot of ideas when I run although sometimes they days that there is nothing but a focus on the running, the air I am breathing and the scenes around me are the best. Today is one of those freezing cold days that I think I will pass on. I can run when it's below 10 degrees, but it isn't always fun. The morning temps the rest of the week won't be as low so I'll get my miles in then. I just started going on walks with two of my girlfriends and the time flies! I love it! It's a wonderful time to chat or just enjoy the Chicago lakefront view (which is beautiful year round) and I agree- it gets you all pumped up- body and mind. Love it. This is inspirational Juli! Have you always been a runner or did you work through the mental barriers and learn to love it? Paula, I guess I have always been a runner although when I started track in junior high, I *hated* running and wasn't particularly good at it. I ran in what they called the "rat race" because it's where they put everyone who wasn't fast or talented at distance. But later in life, I started running to stay in shape and that was that. I've been running off and on since age 18, mostly on since age 27. Still not fast, I just enjoy it. Also my dad was always a runner so I think it's in my blood. And then the red balloon flew up into the sky. An early morning walk in the snow. The Instax and Game Day and Dreams. New stuff. And football, of course. This and that and football and pimento cheese.